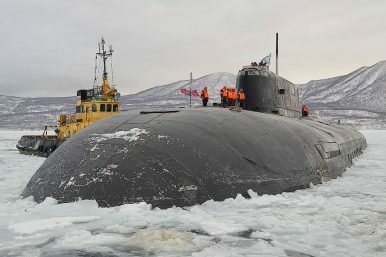 Russia’s Pacific Fleet is slated to receive four Project 949A Oscar II-class nuclear-powered guided missile submarines (SSGN) upgraded with 3M-54 Kalibr cruise missiles by 2021, Russian Deputy Defense Minister Yuri Borisov said on February 6. “We have discussed this issue today and we believe that the year 2021 is a realistic term,” Borisov told journalists while visiting the Zvezda Shipyard, owned by the United Shipbuilding Corporation, in the Russian Far East, TASS news agency reports. The deputy defense minister did not reveal additional details. Nevertheless, it appears to be unlikely that all four Project 949A subs will be ready for service by 2021. As of 2017, only two subs of the class—the Irkutsk and the Chelyabinsk—are being retrofitted at the Zvezda shipyard and the upgrade program has already encounter multiple delays. In 2015, the Russian Ministry of Defense announced that it will retrofit its entire operational fleet of eight Project 949A SSGNs for an estimated $180 million per boat. The status of a third submarine of the class, the Oryol, which caught fire during maintenance work 2015, remains unclear. Russia’s State Armament Program for 2018-2027 now foresees the upgrade of six Project 949A SSGNs over the next nine years. The upgrades are expected to extend the service life of the subs by 15-20 years. Around 40 to 60 percent of Russia’s submarine force is estimated not to be operational. Displacing around 24,000 tons (submerged), Project 949A subs can carry up to 24 P-700 Granit (NATO designation: SS-19 Shipwreck) anti-ship cruise missiles. The SSGNs new primary weapon system, the 3M-54 Kalibr, is a stand-off supersonic anti-ship cruise missile with an estimated range of 270 to 410 miles. The subs could also be fitted “with a land-attack version of the weapon system, dubbed Kalibr 3M14T and 3M14K (NATO designation: SS-N-30A), with a substantially larger range estimated between 1,000 and 1,500 miles,” I explained elsewhere. All four nuclear-powered submarines are slated to be retrofitted with new weapons systems by 2025.